This photo from that catalog shows the screw connector at the controls box, the two transparent cylindrical knobs with slotted-head grubscrews, the overlapping cover on the controls box and the string clamp behind the bridge. This is the same photo as shown in Rowe Industries’ October 1954 red fold-out (Form 112 dated October 1954, shown elsewhere in this site) featuring the Model 1000 Rhythm Chief. This guitar pickup was designed to produce a more even output across all six strings of the guitar than their previous FH pickup series. Prior to the introduction of the Model 1000 pickup, DeArmond’s FH series of pickups – the FH (earliest dated 1941), FHB and FHC-C were all quite similar in appearance and specifically designed for archtop instruments, with the option of a volume controller. This pickup was originally produced in chrome only, with a black insert. This was replaced later by a red insert. Above, the installation instructions leaflet for the Rhythm Chief pickup. As seen in the leaflet above, the components comprised (A) Pickup Body or head, (B) Pressure rod, (C) Master Clamp, (D) Control Box Clip, (E) Control Box (F) Cord Connector, (G) Volume Control, (H) Tone Compensator push switch (I) Rhythm Switch. The method of securing the pickup to the instrument was the same as that used in the FH pickup – the pressure rod (B), the master clamp (C) the control box clip (D) and the cord connector (F). 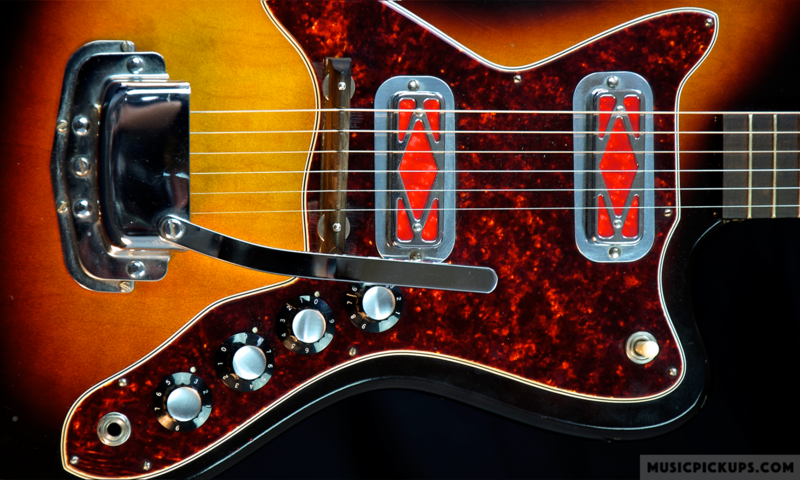 An optional short offset rod used to fit the Model 1000 Rhythm Chief and model 1100 directly to the guitar’s neck was also produced. This rod can also be used to attach the FH series to the neck. Although this item was first produced in the 1950s, the first time it appeared as a separate item in DeArmond’s sales literature is in about 1975, in their orange catalog. The item numbers given to it are 390-00070-90 for chrome and 390-00071-90 for gold.